Analysts are well-known for their attempts to guesstimate just how much x will sell on y. Which makes predictions of iPhone sales on T-Mobile likely to start coming out of the woodwork in droves. One of the first analysts to take a look at the possible sales volume on T-Mobile is Horace Dediu of Asymco. I give Deidu more credit than most analysts who appear to do nothing more than choose sales numbers with a dartboard. Dediu’s arguments are generally well thought out and supported with facts and figures. That said, it’s all a guess at this point until we can get a better idea of T-Mobile’s credit requirements and understanding of how customers are reacting to the company’s new UNcarrier/Simple Choice rate plans. Dediu’s sales numbers are based on sales patterns of T-Mobile’s competition and the percentage of the total subscribers activating the iPhone per quarter. Sales patterns seem pretty consistent across all three national carriers leading Dediu to surmise that T-Mobile will sell 3.4 million iPhone’s in 2013. That’s a big number and would likely make the iPhone the runaway hit of 2013 on the new UNcarrier, but there are plenty of wild cards we can throw out that could impact any possible iPhone sales numbers, or for that matter the HTC One and Galaxy S 4. First and foremost is the basic understanding of the new rate plans and while the appeal of the $99 down payment price will bring customers in, will they find the “value” in monthly payments. Will T-Mobile’s transparent pricing model appeal to new customers as well as existing customers and what impact could a lack of understanding have on iPhone 5 sales? We’ve already seen a a clear demand for the iPhone on T-Mobile with more than 2 million customers using unlocked devices, and that’s a big figure for a device not officially supported by the carrier. So there’s some precedent in place to believe that the iPhone will be highly successful on T-Mobile. Another key fact playing into total iPhone sales in 2013 is that T-Mobile will begin selling all three iPhones at once, with the iPhone 5 going national, and the 4S/4 in “select areas” where refarmed coverage exists or is planned. The bottom line is that there are plenty of variables at work when trying to calculate how many iPhone (or One/Galaxy S 4) sales will T-Mobile see in 2013, Dediu makes one of the more convincing arguments. Regardless of actual sales numbers, it seems like a foregone conclusion that the iPhone will be a runaway hit on T-Mobile, but to what extent is something we won’t know for some time. . Pretty sure the most you would have to put down is 200-250 if your credit is horrible. T-Mobile is usually pretty good about credit. I highly doubt they would make the down payment so high that they would let a potential new customer walk. When I entered my EIP plan, they credited my account 250 to cover the down payment of the phone and some of my next bill. So existing customers should be fine. In most cases it won’t be too high. Only if you have a really high deposit ($200-$400). But, if that’s they case, you should be prepared for that as your deposit at other carriers could be as high as $1000 plus the cost of the phone. Don’t forget the shady power T-Mobile wields; that of BLACKLISTING devices. Your phone goes from iPhone 5 to Paperweight in a flash if you stop paying that bill. Yep. I confirmed with them yesterday that if you buy a phone from someone else (private party) and THEY stop paying their bill regardless of how long you’ve had the phone, the will block the IMEI #. The way they do it is shady because they don’t offer any public database of phones that haven’t been fully paid off. This DESTROYS the secondary market for TMo devices because people won’t buy them for fear of them becoming blacklisted down the road. Someone could be paying their EIP, sell you their phone, then stop paying EIP, leaving you with a paperweight. This affects you as a Tmo customer because they are implicitly destroying the value of your devices. They can easily resolve this, but they benefit from the uncertainty this issue creates. They’d rather old phones went in a drawer somewhere, or get traded in for pittance, and have people only buying their next device from TMo directly. For a carrier purporting to be putting the carrier first this is BS. It would be like buying a car from someone without them having the title, or ability to prove title at all. How would they resolve this? Attach the phone to the current account its on so that it can only be blacklisted if you stop paying the bill? Just one problem, the EIP isn’t on your account. Let me give a scenario. I go into a store, purchase a phone on EIP. Six months later, I sell the phone to Joe Blow and then stop paying my bill. Joe should not have his device blacklisted, I agree. However, it should not keep working either, as I’ve only paid for around a third of the device. If that approach were taken, fraud would skyrocket. I’m not sure how they could solve this problem and I’d guess that is why nothing has been done about it. Tmo doesn’t make anything off of phones, but they do have to pay reps every time someone upgrades. It actually costs them more to do an upgrade then to have someone purchase a used phone. I know this is something people try to ignore, but its still true. The other part to this is some people are STILL selling their phones on Ebay & CL then turning around and reporting them lost/stolen. That is an automatic IMEI block too. I think this whole process needs to be revamped. I’ve asked David to write an article about this issue, but he has ignored me to this point. I even offered to write it up for him. No reply… David? I don’t recall anyone asking me to write an article on this, I’m always open to suggestions for article and even if I didn’t think it was a worthy topic or didn’t want to write on it, I wouldn’t ignore any emails. :-( If it’s a topic you’ve carefully researched and feel like an expert on, by all means write it and submit it. I’m not against guest posts on important topics. I’m glad that you’re open to it, but yes I’ve submitted this concept more than once through your Submit News button. I feel its a huge issue because its affecting the resale value of our devices! I’ve spoken to more than one shop owner and the like who won’t touch TMo devices or will only buy them at steep discounts because of the risk of Blacklisting. This kills demand and prices on the secondary market. If that is happening, then you would need to file a dispute through ebay/paypal. If it was purchased over craigslist, then try to work it out with the seller, or contact the police. Regarding eBay disputes: someone could hypothetically keep paying the EIP until you are outside of the dispute window. NOPE. Thats not at all what I’d suggest. I’d just suggest a web page with one field to enter the IMEI number and press “search.” It would either give you a green light for all clear or a red light for unpaid/lost/stolen. How would you feel about that? It’s a start but if they don’t put something in place to eliminate the crooked people selling phones then reporting them lost or stolen a web page won’t change things a whole lot. That would certainly be a step in the right direction. Still has flaws, very expensive to maintain and it would make the value of any non-paid for phones completely trash. Still, definitely a step in the right direction. They are already keeping the database :-) What I want people to see is this is lowering the value of your T-Mobile devices regardless of whether you own it outright or have an EIP. Everyone who owns a TMo device presently is negatively affected by this if you ever plan to sell it. That doesn’t solve the problem because someone could just sell the device while he/she is in good standing. Once sold it will be too late for the buyer. Also, maintaining such a database could only be funded by adding an extra fee to all wireless subscribers, as if we don’t already have enough regulatory fees already included in all cell phone bills. It would be even worse if we trusted the government to run this database… just go to the DMV or social security. I’d say, it is the responsibility of the consumer to verify they are buying from a reliable source. If its craigslist… buying any item from there is already a problem in itself. I don’t want to pay an extra fee on my bill just because someone else bought a phone from an unreliable source. They won’t even discuss this with you unless you are the original customer. Are you asking if you could pay off the other guy’s balance? I don’t think you can, as far as I’ve been able to tell. Chris the problem is the guy who sold it to you could hypothetically owe $400.00+ for the phone, so they aren’t just going to unblock it for you. Keep in mind you probably just paid $400.00 for it to the guy who sold it to you, so even if you could discuss it with TMobile are you going to want to pay the $400.00 he owed plus the $400.00 you bought it for? They will respond that it is stolen property. Not that you stole it, but you purchased stolen property. Pawn shops are very careful when they purchase things for this reason, if the shop purchases something stolen, and the police or owner requests it back, the shop must hand it over, even though they did not steal it and they purchased it. If you have a blacklisted phone, T-Mobile won’t take it from you, but if its stolen, they won’t let it on to the network until it’s paid for by the original owner. Because I’ve only run into it once, I’m not sure if you can go into the store to do this. Reps have the ability to unblock phones, but I’m not sure what requirements need to be met before the little “remove block” button will be active. Regardless, you can call into care to have this done. It’s also important to note that, your device won’t be blocked if you’re late on a bill, your account needs to be either suspended or canceled before that will happen. I’m not sure which, but if I had to take an educated guess, I’d say canceled. As long as the EIP is paid for, the device shouldn’t be blocked. I’ve only run into this once so it doesn’t seem to be a real wide spread problem. If you’re buying a device off of craigslist, I suggest meeting at the nearest T-Mobile store to have a rep check to see if the IMEI is blacklisted. If this doesn’t work for some reason, call in to customer care to have them check. This is similar to how other carriers do it. If you stop paying your bill on Verizon, they will blacklist your device’s ESN (basically, the ESN is the CDMA version of the IMEI number). While I’m not thrilled about the policy, it’s important to remember that your statement of, “your phone goes from iPhone 5 to paperweight in a flash” isn’t 100% accurate. If you’ve not finished paying for it, it isn’t really your phone. LOL but thats the issue. You can’t easily prove that its fully paid off to someone you’re trying to sell it to. This uncertainly greatly deflates the value of your device. If less people are willing to buy, which many are, then demand drops and price with it. Secondly, the IMEI will not be blacklisted until the seller stops paying the EIP. You can be told today that the IMEI # is good only to have it blacklisted 1, 6, 12 months from now. Whoops, right you are, I responded to the wrong poster, it was Zac who I intended to respond to. As to the issue, I agree that it is a problem, but I can’t see a solution that would be better. I have a great solution. Let me search by IMEI only and tell me if its free and clear, TMobile. This can be done without violating anyone’s privacy. I search the IMEI in their publicly available tool, and it tells me either that the phone is a GO or a NO GO. That why check the phones imei before you buy the phone simple! Yeah, if you do that, you’ll probably not run into an issue. As I’ve said in other posts, I’ve only run into a blocked device due to nonpayment once. All of the other blocked devices were due to the owner reporting the device as lost or stolen. Unless you are the owner of the phone they won’t share this info with you. If you are referring to the shared IMEI Blacklist that TMo now shares with AT&T, well thats another wrinkle; TMo isn’t including EIP Blacklisted phones in that shared database. Like I said there’s no way to find this out beforehand. The IMEI # can be fine today and blocked 1+ months from now if the EIP wasn’t fully paid when you bought it (and could prove it). Couldn’t you just pay the remaining balance off.? Probably not. Depends on the specific situation, but 99 out of 100 times, no. Of course that would work if the deal was cash (you paying them). How would that work if I was trading my device for theirs? That is your problem. Not TMo’s. Um, thanks for contributing to the discussion? what if that balance was 400.00 and you had just paid 400.00 to the thief that sold it to you? Yet another incentive to stop buying carrier variants. Once Google releases a Nexus device with LTE capability, i’ll never buy another carrier-branded phone. Wow, how shady of them!! You steal their property and they disable it!! ZOMG, the nerve of them!!! Get a Grip, Thats not the issue but. I think we all agree stolen phones should be blacklisted. The issue is leaving people in the dark and killing the value of our phones. meant to say “bud” not “but”. Further clarification: My gripe is only with the EIP unpaid devices, not lost/stolen. Reason being you can pop a SIM in a lost/stolen and right away see that its not working. With EIP you are in the dark until its too late. cell phones reported lost or stolen. get your phone reactivated under a new account. their lost/stolen phone databases up and running (by November 30, 2013). According to CTIA, Sprint/Nextel has already implemented its database. carriers will be integrated into a single database. Guttman-McCabe acknowledged. “I tend to see this as a glass half full. include Web pages about phone security, mobile apps, e-mail information, bill inserts, and more. this service, and most mobile security vendors, such as Lookout or Norton, offer remote wipe as part of an annual subscription service package. is considerably more difficult for thieves and could act as a deterrent. therefore can’t activate it, you won’t get your money back. The complaint is not the existence of this data base or even the actual blacklisting itself. The complaint is more on how it’s being done, maintained etc. If I purchase a phone today and activate it (clean IMEI), I, as a consumer, have no recourse to prevent the IMEI from being blocked tomorrow because the seller reported the phone as lost. Similar scenario with unpaid device balances. I have no way of knowing by checking the IMEI # that you have paid the full balance off or that you won’t stop paying 7 months from now leaving me with a paperweight. Except with Verizon and Sprint, I can walk in and activate a phone on my account (with a clean ESN #). If the original owner doesn’t pay their bill, the phone is on my account and continues to work. With T-Mobile and I assume AT&T, I can purchase a phone (let’s assume there is no EIP payment here) legitimately today and start using the phone. Tomorrow I can wake up to it no longer working because the original owner wants to commit fraud by reporting the phone as lost. There should definitely be a system of blacklisting IMEI and ESN #’s. The way the current system is set up; however, is leaving many consumers out of money and a phone with no recourse. Honestly, the average consumer has absolutely no idea that this is happening or can take place let alone happen to them. Zac/Pantherlady have hit the nail on the head with this one! As consumers, I dont see how anyone in their right mind could object to his proposal. As paying customers, we should have the right to protect ourselves from potential scams and fraud. Maintaining such a database could easily be paid by the increased revenue as a result of the virtual elimination of fraudulent lost/stolen claims. Last I checked, handset insurance prices remained the same. We need to join and submit a complaint to the consumer protection bureau. I actually think the shared blacklist is a great idea for lost/stolen/blacklisted. The problem is TMobile doesn’t share their EIP Non-payment IMEIs with this database. T-Mobile’s case is far worse do to the haze that unfulfilled EIPs bring. I just want to be able to see if a phone is fully paid off or still has payments remaining. I don’t need specifics or privacy breaching information. Also worth noting, that while the credit brackets change often, and fluctuate throughout the year (this is normal in wireless), a 720 credit score should put you considerably above where you need to be to have no deposit and get the “well qualified” pricing. Keep in mind though, that in the end, a customer in the highest credit bracket pays the same as a customer with a $400 deposit and needs to pay the higher down payment. Of course, that is in the end, it is still a lot to have to pay upfront. T-mobile will lose lot of business based on their new UNcarrier Plans available right now basically u are buying the phone @ full price. Its playing with ppls mind. why would somebody buy a phone from tmobile when u can buy that same phone for $200-$300 cheaper from ebay and amazon. SmartShopper you are not very smart! How can you buy a NEW iPhone 5 for $200-300 cheaper? Even a used one is not $200 cheaper. Really? Last time I checked every high end up is about the same on ebay new. Why would I spend money on some used POS from ebay that can be broken for all I know. I hate when people say they are paying ” full price “. Its the same thing as a normal contract plan but 20 bux cheaper. Your paying full price just the same on normal plans then with UNcarrier plans. The higher bill just makes up for the lower upfront cost of the phone. While your ebay plan is very flawed, lets say you do BYOD that you got 200 to 300 cheaper… Whats the problem? T-Mobile welcomes you to bring your own phone and not have to pay the marked up price on the plans. The answer is because you CAN’T buy the SAME iphone from ebay or amazon. Read the article on this site yesterday that will explain the differences to you. EVERY carrier sells the iphone at full price, but some just hide part of it in the monthly cost. 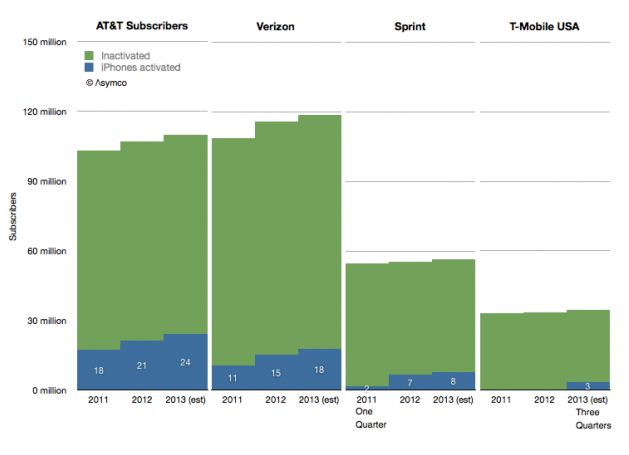 T-Mobile iphone5’s will run best on their network because it will run 4G the fastest. You are correct though about Google’s Nexus 4 if you buy it new from Google Playstore. T-Mobile has allowed people to bring other phones to them for a long time and I am sure they have lost the “profit” in selling a phone to them. Hopefully as people on other carriers have their contracts end they will consider moving to T-Mobile for the flexibility they get and the cost effective plans. Coverage, service, phones,flexibility, and price should be the deciding factors. I applaud T-Mobile for moving in the right direction. The iPhone is definitely a runaway on this site. I’m not complaining, as I realize that the iPhone launch is important. But, you would barely know that the BlackBerry Z10 launched on Tuesday with all of this iPhone coverage that we are seeing on this site. BlackBerry Z10 has gotten one post since Tuesday while the iPhone has gotten more than I can count. Its a sad reflection of the sales of Blackberry vs iOS. Lots of iPhones sold, lots of coverage. Very few BB sold, very little coverage. Lots of demand and excitement for iOS, very little demand or excitement for BB. I agree I think the iphone is going to ruun this site, it seems they always favored the iphone here. What do you expect? Its Apple. I think you have to weigh the factors here when I determine what warrants coverage. The Z10 has already been covered and since I don’t have a review unit and there hasn’t been any “new” news on it, there’s not much more I can post. IF I had a review unit, that would change things. The iPhone is the T-Mobile unicorn and you’ll notice that none of my posts have pertained to the device itself, only the news that T-Mobile will carry it and how it will work. Once the iPhone launches, attention turns to the next great phone on T-Mobile, the One, and then the S 4 following that. It really amazes me that you guys haven’t discovered this pattern already…the next “best” phone on T-Mobile dominates coverage. There’s a finite amount of phones releasing on T-Mobile at any given time, so of course one phone gets more attention. I really don’t see how may personal leanings come into play. Please remember this is a T-Mobile news site, not an Android site, or an Apple site. I cover news at it pertains to T-Mobile. You don’t make a percentage off people who walk in and buy a brandnew device cash.? Not if they pay full retail. You might make money off adding internet to a plan… but most people already have a data plan now anyway. Not so much as a penny. In my case, I work at a branded dealer, but, the same holds true for corporate as branded and corporate are 99% the same (minus of course, who signs your paycheck). I’ve no idea about authorized dealers though. I’m not sure about the new plans though, there might be a way around this now. Haven’t run into this yet though so I’m not sure. You haven’t seen the new commission structure for corporate yet apparently. I have, but not since Sunday. If they’ve changed, then that’s good for them. I paid attention, but I don’t work for corporate. If they want to increase sales, they should not have allowed the OTA upgrade for LTE that’ll almost ensure 2 million of sales. I disagree I think t-mobile will sell at least 5 times that amount 3.4 million is such a low ball number. The fraudsters are going to have a field day with TMO!!!! $99 down for an iphone 5 and then skip out on the bill and sell the phones overseas. $100 more profit over getting them at Verizon and ATT.